Commercial aviation has changed the world immeasurably, facilitating world trade and economic growth, bringing people together in a way that was not possible before, and simply making the world a more connected place. According to the International Air Transport Association (IATA), airlines in 2014 connected 3.3 billion people and 52 million tonnes of cargo over 50,000 routes, supporting 58 million jobs and delivering goods with a value of $6.8 trillion. But when and where does commercial aviation find its inception? From the earliest beginnings, man’s ascent to flight has been one of gradual progress, accented by a handful of dramatic breakthroughs. The Wright Brother’s accomplishment would of course be one such breakthrough. Though several others can claim successful efforts at manned, powered flight prior to Kitty Hawk (see article, “First Human Flying Machines”), the Wright Brothers hold a special place in history because of the profound and lasting impact of their achievement in relation to modern aircraft design (three-axis control). Similarly, in the history of commercial aviation there is evidence of gradual evolution – from stunt plane and site seeing passenger flights to flying airboats that flew just a few feet above the water to the first real examples of modern air travel involving regularly-scheduled overland air service using land-based runways. And there are a few critical breakthroughs as well that would play a important role in the birth of a new industry. 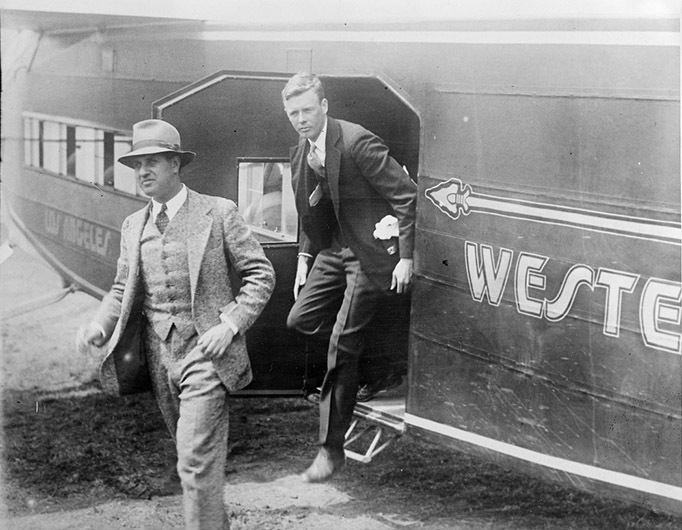 Harry Guggenheim and Charles Lindberg leaving New Western Air Express plane in 1928. Courtesy of the Boston Public Library, Leslie Jones Collection. In 1927, a fund was setup by the Guggenheim family to create a “model airline” in order to provide a successful blueprint that all airlines could follow and to demonstrate to the American public that commercial passenger service could be safe, dependable, economically feasible, and even comfortable. It would establish one or more “thoroughly organized” passenger routes with radio communications and meteorological services approved by the Department of Commerce’s Aeronautics Branch. Guggenheim would select the operation managed by Harris “Pop” Hanshue, a famed race car driver who ran Western Air Express (WAE), which would later become Western Airlines before ultimately joining the Delta family. Western Air Express, as Los Angeles Times writer Robert E. Dallos describes, was the airline that “gave Los Angeles its first transcontinental air service and put Southern California on the airmail map.” Hanshue’s group were trailblazers in the truest sense, being described by Western Airlines chairman and CEO during the 1980s, Jerry Grinstein, as having the “pioneering spirit that settled the American West”. As such, when Western Airlines became part of Delta in 1986, Delta inherited bragging rights to the oldest ticket sold for passenger airtravel. No U.S. airliner in operation today can say it issued a ticket prior to the one sold in 1926 to Mr Ben Redman of Salt Lake City, Utah. When Western Air Express pilot C.N. “Jimmy” James took off on his regular eight-hour mail delivery flight from Salt Lake City to Los Angeles on May 23, 1926 – almost exactly one year prior to the famous transatlantic flight of Charles Lindberg – he would do so carrying what was proudly referred to by Western Airlines CEO Arthur Kelly in 1961 as the “first commercial airline passenger”. The recipient of this honor would be then president of the Salt Lake City Chamber of Commerce Ben F. Redman who, along with his friend (and second passenger) J.A. Tomlinson, sat atop U.S. mail sacks, sported his own parachutes, and relied on a tin cup for the in-flight lavatory. 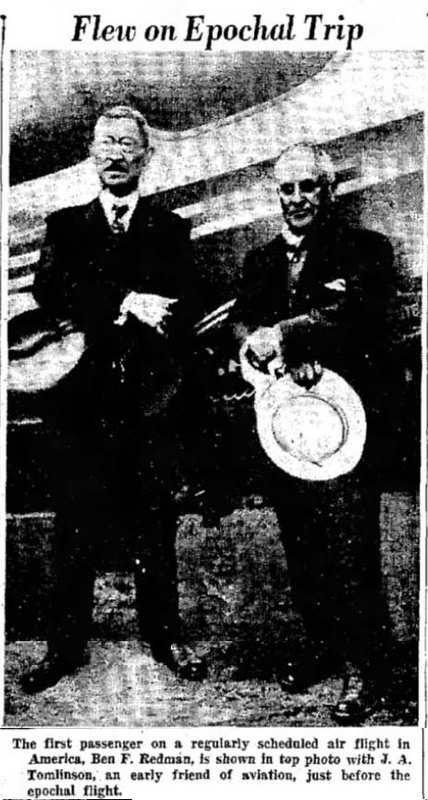 Source: “Elliott Roosevelt Inspects Airlines”, Salt Lake City Tribune, September 25, 1933, p.22. Upon completion of the inaugural flight, a certificate signed by the pilot Jimmy James was presented. 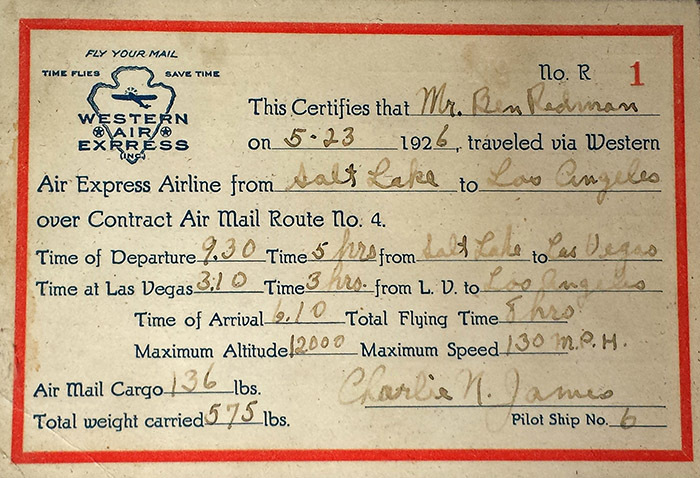 The certificate (shown below) confirms Redman as the first official passenger, as well as recording details of the flight including maximum altitude reached (12,000 feet), the maximum speed (130 mph), total flying time (8 hours), and Contract Air Mail Route (No. 4). 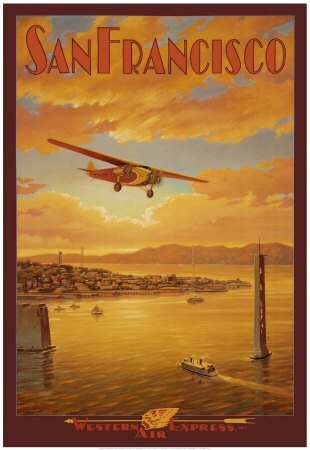 Vintage Art Poster shows a Western Air Express plane flying over the location where the Golden Gate Bridge now stands. Helped by the Guggenheim grant, along with the infrasture and other innovations spawned by the model airline experiment over the next few years, Western would not only avoid bankruptcy but would go on to become an industry giant. After surprising many by posting a profit of $28,674.19 in its first year of operation,  Western Air Express would the following year, in 1927, become the first airline in history to pay a cash dividend to its stockholders. In 1928, it would post a profit of approximately $700,000. And by 1930 it had become the largest airline in the nation by most overall standards of measurement – including fleet size, passengers carried, and route mileage with routes stretching 15,832 miles. (That same year it would also introduce to the world of commercial aviation what was at the time by far the largest passenger plane in the world, the four-engined 32-passenger Fokker F-32, as shown below). Of course, the Guggenheim fund that helped fuel this success was never intended to provide an economic advantage to any one airline in particular, but rather to buoy the entire industry – and that is indeed what it did. The success of the model airline experiment would not only benefit Western but would in effect usher in the beginning of sustainable economic progress for all U.S. airliners through a number of key innovations. One innovation of lasting impact achieved by the model airline would be the first weather reporting for passenger airplanes. In August 1927, the Daniel Guggenheim Committee on Aeronautical Meteorology was created to make pilots and meteorologists aware of each other’s specialties. The five-person committee, all of whom would achieve prominence in meteorology and two of whom would become chiefs of the Weather Bureau, recommended that the Guggenheim Fund equip a section of the airway system with weather reporting systems to prove the feasibility of such a system. Ultimately, it was decided to carry this out along the Western Air Express model air line route, resulting in an initial twenty-two reporting stations connected via telephone to Los Angeles and San Francisco, and soon later more would be added. These would serve all airmen, not just those of Western Air Express. During its yearlong test, not a single weather-related accident occurred. The Weather Bureau took over the weather reporting service officially on July 1, 1929, and the service eventually spread nationwide. 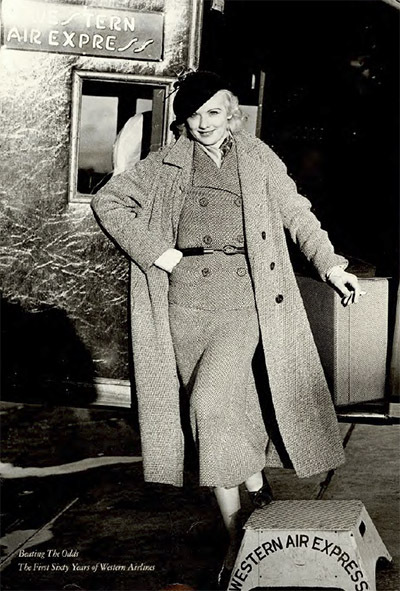 A dazzling Lucille Ball is shown here after a flight on a Western Air Express Fokker F-10, a plane referred to as the “Queen of the Model Airline”. Even though mail revenues still constituted the majority of income, and profitability solely from passenger service was still a few years away, the public relations impact, the technological advancements, and the lessons learned as a result of the model airline experiment would greatly facilitate eventual realization of profitability in the industry. Though there would be many ups and downs in the years to come,[N 3] Western Air Express and the rest of the budding airline industry in America had positioned themselves on arguably the first path to sound economic success in the world of commercial aviation. Other carriers would soon follow Western Air Express’s lead in providing passenger service across the nation, with increasingly safe and cost effective passenger aircraft. America was officially on its way to emerging as a global leader. When C.G. Grey, the editor of the English aeronautical journal Flight, arrived in New York in January 1925 to gauge the state of aeronautics in the United States. he commented, “The general atmosphere of aviation in America impressed one as being in a state when something is about to happen. Not so much the calm before the storm, but rather the slump before the boom.” These words would prove to be prophetic as the U.S. airline industry would grow exponentially after 1926. Passenger airtravel had become a reality. The U.S. aviation industry would eventually go on to represent the largest single market in the world, accounting today for over one‐third of the world’s total air traffic (in addition to claiming the world’s largest airline, American Airlines). It may also be said that an even brighter future yet awaits it. In fact, by the year following the upcoming centennial of that inaugural passenger flight of Western Air Express (2027), the FAA projects air travel demand in the U.S. to top 1 billion passengers per year. The United States clearly was in the doldrums so far as aviation was concerned. By contrast, a year after the armistice, Britain and France were operating scheduled flights between London and Paris. The Germans had an all-metal transport 10 years before William Stout designed one for Henry Ford. The French had an internal airmail system that far outdistanced the United States’ fledgling airmail service. Italy’s Gianni Caproni had built a 100-passenger, eight-engine flying boat. And even the Russians, as far back as 1913, had a four-engine airliner designed by Igor Sikorsky that boasted an enclosed cockpit and passenger cabin, electric lights and a washroom. But even as America itself was founded in a story of “beating the odds”, so too would this generation of Americans rise up to meet the challenge before it – heeding the wisdom of the words spoken by one of the nation’s brightest businessmen and entrepreneurs of the time, Henry Ford: “When everything seems to be going against you, remember that the airplane takes off against the wind, not with it.” A movement would soon take off in America that would change its fortunes – a movement that would find its impetus when the U.S. Government first began experimenting with the use of planes to transport mail. In 1917 Congress, acting on a recommendation from the National Advisory Committee for Aeronautics (NACA) which would later become NASA, appropriated $100,000 for the creation of an experimental airmail service. This would include involvement from both the Army and the Post Office. One of the contributions from the Army was providing pilots to fly the mail planes – a particularly dangerous job. In fact, during the period the Post Office operated the air mail, the life expectancy of a Mail Service pilot was only four years, and thirty one of the first forty pilots were killed in action. The Army also assisted with the initial deployment of rotating beacons that would make it possible to fly the routes at night. The Post Office would take over soon afterwards, expanding the guidance system the following year to make transcontinental air service possible. By 1923, mail could be delivered from one coast to the other in two days less time than by train. “The same year Congress passed the Contract Air Mail Act, President Calvin Coolidge appointed a board to recommend a national aviation policy (a much-sought-after goal of then Secretary of Commerce Herbert Hoover). Dwight Morrow, a senior partner in J.P. Morgan’s bank, and later the father-in-law of Charles Lindbergh, was named chairman. The board, popularly known as the Morrow Board, heard testimony from 99 people and, on Nov. 30, 1925, submitted its report to President Coolidge. The report was wide-ranging, but its key recommendation was that the government should set standards for civil aviation and that the standards should be set outside of the military. Through these acts of Congress in 1925 and 1926, the essential framework had been established, and the ground was ripe for the birth of a new industry. In fact, the initial Contract Air Mail (CAM) service carriers selected through this process would in time and through mergers and acquisitions go on to become key players in the airline industry, including American Airlines, United Airlines, Western Airlines (which as mentioned would eventually be acquired by Delta Airlines, who was also a CAM carrier beginning in 1934), Boeing, Pan Am, Trans World Airlines (TWA), Northwest Airlines, Braniff, Continental, and Eastern Airlines. These would also greatly influence the advancement of technology and infrastructure that would allow passenger airtravel to survive and prosper in the decades to follow. Starting with an initial group of five, a total of 34 Contract Air Mail routes would eventually be established in the U.S. between February 15, 1926, and October 25, 1930. CAM 1 New York – Boston Awarded to Colonial Air Transport, an outfit backed by Rockefeller, Vanderbilt- Whitney, and Fairchild money. and managed by Juan Trippe, founder of Pan American Airways. 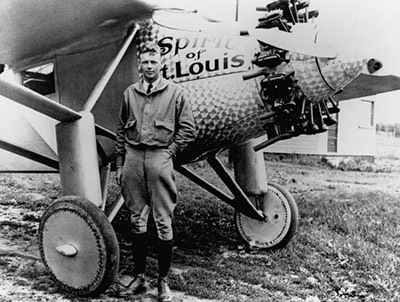 CAM 2 Chicago – St. Louis Won by the Robertson Aircraft Corporation with Charles Lindbergh as their chief pilot. Robertson would become part of American Airlines. CAM 3 Chicago – Dallas Went to National Air Transport, owned by the Curtiss Aeroplane Co., which was headed by Clement Keys and backed by Charles Kettering of General Motors and Howard Coffin of the Hudson Motorcar Company. The various subsidiaries owned by this group would eventually be merged into several airlines including United Airlines, Transcontinental and Western Air (TWA), and Eastern Airlines. CAM 4 Salt Lake City – Los Angeles Awarded to Western Air Express (WAE), managed by famed race car driver Harris “Pop” Hanshue and backed by Los Angeles Times publisher Harry Chandler. WAE would merge into Transcontinental and Western Air (TWA), then sever from TWA in 1934 and eventually merge with Delta Air Lines in 1986. CAM 5 Elko, Nevada – Pasco, Washington Won by Walter T. Varney of Varney Airlines, which was obtained by United Air Transport management company in 1930. In May 1934, Varney, along with Pacific Air Transport, Boeing Air Transport, and National Air Transport, would merge with United Airlines. 1926 was a watershed year for commercial aviation. It would be one of many key milestones, and one that would see the first economic successes. As mentioned, 1926 would be the year of what has been referred to as the first true commercial passenger flight in the United States. Additionally, the Federal Aviation Association’s most recently published chronology dates back to that year (FAA Historical Chronology, 1926-1996), beginning with the Air Commerce Act. 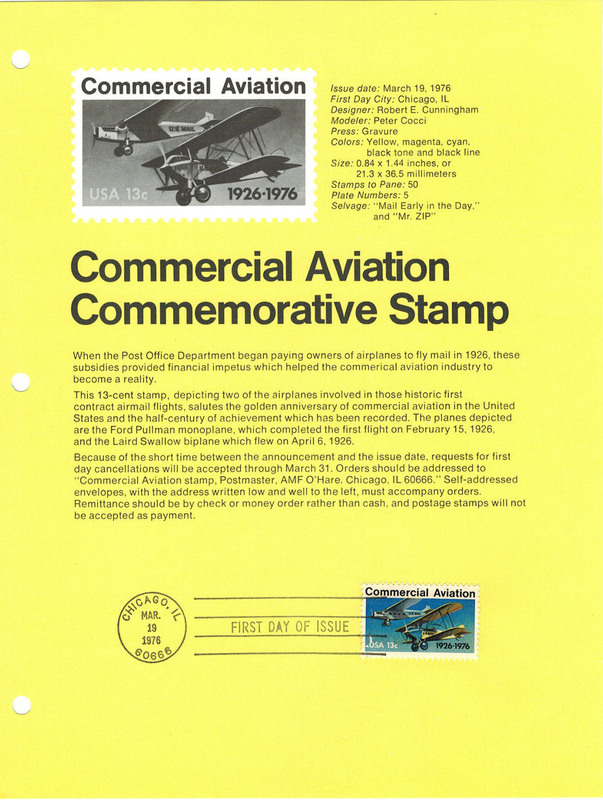 And in 1976 – coinciding with the nation’s bicentennial – the U.S. Post Office would issue the Commercial Aviation Commemorative Stamp marking the “golden anniversary of commercial aviation in the United States” with the description “Commercial Aviation, 1926-1976″ (See the first day of issue cover for this stamp). 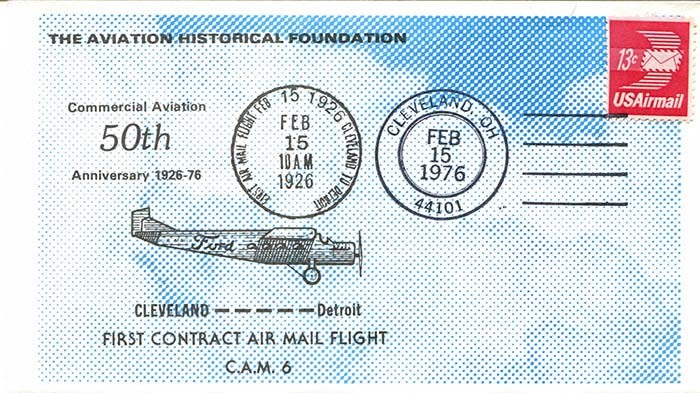 1926 being the year the “CAM” carriers would began carrying U.S. Air Mail under contract, the planes shown on the 1976 stamp were the first two to do so: the Ford-Stout AT-2 (upper) and Laird Swallow (lower). 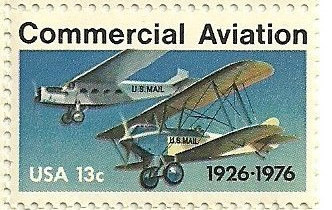 Other groups, such as the Aviation Historical Society, would also honor 1926 as the true beginning of U.S. commercial aviation (as shown below). In addition to numerous legislative and general infrastructure advancements, there were other factors as well that led to the growth of passenger airtravel in the United States beginning in the mid-1920s. One of those can be attributed to the contributions of automobile pioneer Henry Ford. In 1925, Ford began a commercial cargo airlines called the Ford Air Transport Service and would be awarded the CAM6 and CAM7 airmail routes. Although not receiving one of the initial five routes, he would actually be the first of the carriers to begin operation in 1926, staking the company’s claim as “the world’s first regularly scheduled commercial cargo airline.” He would soon abandon that venture however in favor of focusing on airplane manufacturing, selling its routes to Stout Air Services (which was eventually acquired by National Air Transport (NAT) who in turn became part of United Airlines). It was in two primary areas that Ford would help shape the history of commercial aviation. The first of those was in airplane technology, through the introduction of the Ford Trimotor – the first all-metal, multi-engine transport in the United States and the first plane designed primarily to carry passengers rather than mail (having room for 12 passengers and cabins with high ceilings that didn’t require stooping). Ultimately, the Great Depression ended Henry Ford’s short career as a major figure in American aviation. He would pass the baton to companies like Boeing, who introduced the Boeing 247 in 1933, and the Douglas Aircraft Company whose DC-3 would revolutionize air transportation for the next decades (along with Wright Aeronautical and Pratt and Whitney who would dominate the engine market for years to come). In the meantime, however, United Aircraft and Transport Corporation took over the Ford airmail routes in 1929 and the Ford Airplane Manufacturing Division closed for good in 1933. Though similar to the way Ford’s durable Trimotor planes seemed to last forever (One Trimotor 5-AT, built in 1929, was still being used in Las Vegas for sightseeing in 1991), so was Ford’s impact on commercial aviation long lasting. Not only did the advancements in plane construction help move the industry forward, but Ford was also instrumental in a second important breakthrough: gaining the American public’s trust when it came to flying. Ford’s involvement in airplane manufacturing, coupled with the government legislation of 1925-1926, provided a stamp of approval in the eyes of the public and for the first time ever passenger flight began to be seen not as merely a novel and risky venture, but as a new and trustworthy way of travel. In fact, just as Ford traveled around the country through his “Reliability tours” to promote the idea that the automobile had come of age in America, so did he do the same for the airplane – in part through the aerial version of his Reliability Tours, the Ford National Reliability Air Tour. While Henry Ford helped to provide the American public with assurance in relation to the safety and reliability of airtravel, another individual would take that a step further in 1927 and create enormous excitement in the world of flight – not only in America, but across the globe. On May 20, 1927, a young pilot named Charles Lindbergh would make history by setting out on a 33.5-hour journey across the Atlantic Ocean, becoming the first person ever to fly a transcontinental nonstop flight in an airplane. And he did it all as a solo flight in a single-seat, single-engine monoplane named Spirit of St. Louis. “In planning his transatlantic voyage, Lindbergh daringly decided to fly by himself, without a navigator, so he could carry more fuel. His plane, the Spirit of St. Louis, was slightly less than 28 feet in length, with a wingspan of 46 feet. It carried 450 gallons of gasoline, which constituted half its takeoff weight. There was too little room in the cramped cockpit for navigating by the stars, so Lindbergh flew by dead reckoning. He divided maps from his local library into thirty-three 100-mile segments, noting the heading he would follow as he flew each segment. When he first caught sight of the coast of Ireland, he was almost exactly on the route he had plotted, and he landed several hours later, with 80 gallons of fuel to spare. Lindbergh’s greatest enemy on his journey was fatigue. The trip took an exhausting 33 hours, 29 minutes and 30 seconds, but he managed to remain awake by sticking his head out of the window to inhale cold air, by holding his eyelids open, and by constantly reminding himself that if he fell asleep he would perish. In addition, he had a slight instability built into his airplane, which helped keep him focused and awake. 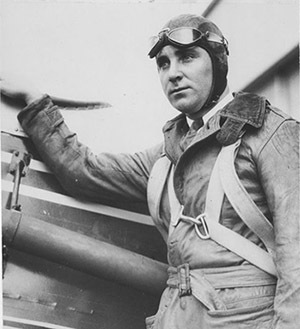 As a young U.S. Air Mail pilot hired in 1925 by the Robertson Aircraft company (that would later become American Airlines) to fly the CAM-2 mail route between St. Louis and Chicago, Lindbergh was suddenly thrust into the spotlight as an American hero, as well as the first person to ever be in New York one day and Paris the next. It captured the imagination of the public in relation to the capabilities of modern airtravel, as well as the imagination of investors. Though many in years past had invested in aviation ventures that had failed, suddenly there was a rush to Wall Street to invest in aviation, with investments in aviation stocks tripling between 1927 and 1929. After his legendary feat, Lindbergh was faced with enthusiastic crowds wherever he went. He gave numerous speeches, participated in parades, and received many awards, including the Distinguished Flying Cross medal from President Calvin Coolidge, using his status as an American icon and international celebrity to further aviation along with other noble causes. “Daniel Guggenheim began to discuss the possibility of expanding his involvement, spending several million dollars on the creation of a fund that would support civil aviation. Father and son, the Guggenheims discussed the idea with everyone from Orville Wright to Secretary of Commerce Hoover and President Coolidge. The decision to forge ahead had been made by January 1926. The fund would go on to create schools of aeronautics at major universities, including Stanford, MIT, and Harvard, among several others. The impact would be far reaching with respect to the research conducted, the technological discoveries made, and perhaps most importantly the development of the graduates – from pilots to engineers to meteorologists. One of those graduates was Herbert Hoover, Jr., son of 31st President of the United States Herbert Hoover and eventual Secretary of State under President Eisenhower. Hoover won a fellowship from the Daniel Guggenheim Fund to study aviation economics at the Harvard Business School, and would focus on the economics of radio in the aviation sector. He would use that education to help Western Air Express, in cooperation with Thorpe Hiscock of Boeing, to develop the first ever air-to-ground radio while serving as Western’s communication chief. Under his guidance, Western would also establish a system capable of guiding radio-equipped aircraft along 15,000 miles of airways across the Western U.S. And in 1930 he would be elected president of Aeronautical Radio Inc. – a non-profit alliance between Western Air Express, Boeing and American Airways that represented the airline industry’s single licensee and coordinator of radio communication outside of the government. This selection led to Time Magazine putting Hoover on the cover of its July 14, 1930 edition. Even beyond education, the Guggenheim fund would make major contributions to the aviation industry. An example was its revolutionary breakthroughs in relation to “blind flight”, addressing the problems faced by pilots in three main areas: point-to-point navigation while in fog or above clouds, maintaining straight and level flight via instrument readings, the usage of ground facilities for take off or landing assistance in poor visibility conditions. In September 1929, a young U.S. Army lieutenant named James Doolittle took off from Mitchell Field in New York on a 15-minute test flight. When his wheels touched down, he had reached a major milestone in aviation history, being the first plane in history to take off, fly a precise flight path, and land, with its pilot not using any visual cues outside of his cockpit instruments. The instruments that made this possible included a very accurate barometer, an artificial horizon and gyroscope, and a radio direction beacon – all developed through research at the Guggenheim Full Flight Laboratory. Within the next decade, instrument flying would become routine for all airlines. Though the fund would cease, however, its impact would live on – as would the Guggenheim’s work through other avenues. The Guggenheim foundation for example established such entities as the Cornell-Guggenheim Aviation Safety Center at Cornell University where important research took place in relation to collision avoidance, crash fire protection, and other aspects of safety improvement. The Guggenheim Medal fund would be awarded annually to individuals making exceptional contributions to aviation, with the first going to Orville Wright. And the Guggenheims sponsored much of the research of Dr. Robert J. Goddard, upon which all modern developments of rockets and jet propulsion was based. Arguably though, the greatest impact of the Guggenheim legacy remains that of the decision to provide funding to a courageous group of aviation trailblazers and the establishment of the world’s first “model airline”. 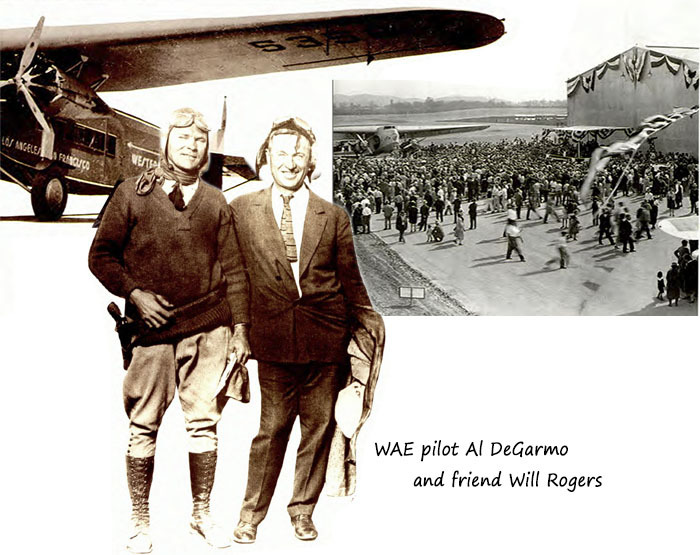 Together, the Guggenheims and Western Air Express would pioneer the first semblences of airtravel as we know it today – year round, regularly scheduled, overland service using landplanes – and pave the way for the first truly self sustaining and economically successful model in commercial aviation. The legacy and impact of the Guggenheim Fund would live on many years past the end of the model airline experiment, as would that of Western which would go on to establish many industry firsts[N 8]. In fact, Western would eventually take on the label of “America’s senior air carrier” as well as the “oldest continuously operating airline in the US”   [N 9] at the time of its acquisition by Delta in 1986. Even as it became part of the Delta family, the innovations and progress of Western, much of which was derived from its earliest years,[N 10] would carry on not only in spirit but in everyday business operations. To this day, for instance, Delta continues Western’s Salt Lake City hub operations, which is the same location from where that first passenger flight of Western Air Express took place in 1926 – an event that would set in motion the first true success story in commercial aviation. When history is remembered, what generally emerges to the forefront are not necessarily the “firsts”, but the events, discoveries. and individuals that had the most powerful influence in shaping the future. Christopher Columbus was not the first to discover America. Yet the fact that his name looms larger in history than many of those who proceeded him – including the Vikings led by Leif Erickson, the waves of Carribean explorers like the Taino tribe, and potentially even Monks like St. Brendan who it is believed made the journey in the sixth century – is because of the unparalleled impact of his explorations. Christopher Columbus opened up a new continent to Spain and, ultimately, all of Europe. His discovery had a profound and lasting impact on the trade routes of the day. And his voyages would ultimately reshape the known world. Similarly, Henry Ford did not invent the automobile and yet his name is synonymous with it. For it is he who changed the landscape of a nation, and world, by making the automobile an affordable reality to the average person. Through use of the assembly line technique of mass production, and by lowering costs as opposed to pocketing profits from the resulting cost savings, Ford’s company would go on to lead the American industry to produce three quarters of all automobiles in the world by 1950. Taking transportation to the next level would be the Wright Brothers, even though technically they were not the first to fly manned aircraft. In addition to those lifted by hot air balloon and airships such as Jean-François Pilâtre de Rozier who flew the first manned free balloon flight on November 21, 1783, there are others who flew heavier-than-air crafts in the rough form of the modern day airplane beginning in the early 1800s. And while many of the pioneers who did so would make significant contributions to the science and eventual realization of powered flight (which the Wright Brothers themselves would even rely upon), the Wright Brothers hold a special place in history because of the unique impact they had on airplane design. While other early inventors experimented with the shifting of a persons weight to control or steer the plane, for instance, the Wright Brother’s revolutionary invention of “three-axis control” would make fixed-wing powered flight truly possible for the first time ever and would be adopted universally in aircraft design moving forward. In a similar way, there were various early attempts to launch the world of commercial aviation, ranging from paid sightseeing flights on crop dusters to a handful of failed airboat ventures. But perhaps the most significant breakthrough came via a great American success story – that of the Guggenheims and Western Air Express, and of the movement of the mid-1920s that involved one of the greatest collaborations in human history. From the legislation that laid the early groundwork to the humble beginnings of a two-passenger inaugural flight in an open cockpit atop mail sacks to the investments made by many, this is a story of American ingenuity, of the unique American balance between government and private enterprise, and of the spirit of the American West. These truths are emphasized not merely in the spirit of American patriotism, but more so in the spirit of the model airline experiment – that the success of one might benefit many (also an American principle). For the hope is that the blueprint discovered here might lead others to greater successes, whether nations or groups of individuals or other generations of Americans. Today the Wright Brothers are recognized as among the greatest of the pioneers of flight – though it wasn’t until after they died that they were finally credited over such men as Samuel Pierpont Langley as being the first to build a heavier-than-air craft capable of manned powered flight. It sometimes takes time for the truest heroes of history to be appropriately honored. Hopefully this story of the beginning of commercial aviation will be told with greater attention paid to these great men and women who took the baton from the Wright Brothers and brought aviation to the next stage of development. For while the Wright Brother’s sought and achieved sustainable (and controlled) flight, these pioneers of the mid-1920s sought and achieved sustainable economic growth that would make it possible to take the innovations of the Wright Brothers and turn them into the means of forever changing the world of global transportation. ^It is worth noting that the Guggenheims didn’t expect to be paid back for this loan and in fact told Western Air Express founder Harris Hanshue this was more in the nature of a grant. However, Hanshue refused to accept the money as a gift and insisted on inserting a clause into their agreement that stipulated Western was to repay the loan within eighteen months at 5% interest. Hanshue also put up some $100,000 in public-utilities securities to guarantee the loan. ^It should be noted that the road to prosperity for Western and the industry in general was not only filled with successes, but involved setbacks as well. One particularly dark chapter in the history of the commercial aviation industry occurred during the 1930s, though the Air Mail Act of 1930 that consolidated all of the air mail routes to only three companies (United Airlines, TWA, and American Airlines) and the resulting investigation of a 1930 meeting (the so-called Spoils Conference) involving postmaster general Walter Brown and representatives of the three airlines to whom he would later award the air mail routes. This would be referred to as the Air Mail Scandal and Air Mail Fiasco by the American Press as the actions under the new legislation were accused by many of being a corrupt effort of conspiracy to monopolize the air mail. Though allegations relating to this were never proven, there was enough room for suspicion to convince President Franklin D. Roosevelt to cancel the contracts altogether and have the Army Air Corps take over the service. This would not only negatively impact the airline industry in general, but would have disastrous results in many ways since Air Corps’ airplanes could not meet the demands of night flight, let alone bad weather. There were many deadly crashes and lost lives, until finally later the same year Congress passed the Air Mail Act of 1934, which returned most air mail routes to the major airlines as well as gave some routes to smaller airlines. ^While Western Air Express greatly benefitted from infrastructure improvements and other provisions of the government, it was able to attain profitability without any direct government subsidies. It also received a low interest 5% loan of $155,000 to be paid back over 2 years courtesy of the Guggenheim Fund in 1927, which enabled it to purchase three Fokker passenger planes. Even after the first of its two annual loan payments was made to the Guggenheims in 1928, WAE was still able to report a net profit of nearly $700,000 on $1.4 million in total revenue (most of this though still coming from mail revenue at the time). ^This cooperative agreement between five competing airlines marked the first time in the history of aviation that major airlines combined their experience and finances for the development of an experimental plane to meet future needs. And the joint effort was a giant success. It is estimated that had each of the five airlines carried out development efforts separately, it would have cost them approximately $2,000,000 more, the equivalent of four additional experimental planes. ^US Department of Commerce statistics report 1,176,858 passengers flew on US commercial airliners in the year 1938. American operated scheduled air carriers would also set all-time records that year for the number of miles flown and passengers and express carried, according to reports received by the Civil Aeronautics Authority (as cited in Popular Aviation, September 1939. p.26). ^Western Airlines was the first to develop and use air-to-ground radio (1929), the first to have weather reporting stations (1927), first to fly 10 years without injury to a passenger (1926-1936), the world’s first profitable air transportation system (1926), the first airline in history to pay a cash dividend to its stockholders (1927), the first “regularly scheduled, year-round, overland passenger service” in the U.S. (1926), the first to offer in-flight meals (1928), the first to have flight attendants in U.S. domestic service (1928), the first to introduce commercial four-engine transports, the first to feature airborne television, the first to offer limousine service, and the first to provide log books for passengers. ^At the time of Western’s merger with Delta, there was some controversy between Western and United Airlines over which was officially the oldest. United was originally formed by United Aircraft and Transport Corporation, a partnership between Boeing Airplane Company and Pratt & Whitney. The larger corporation officially established an operating division known as United Air Lines on July 1, 1931. That same year, however, it would purchase Varney Airlines. While Western preceded Varney in relation to the introduction of passenger service, Varney beat out Western (by a margin of 11 days) in flying “fixed routes” with respect to airmail delivery. ^A Global Mindset for Commercial Aviation’s Next Century. Retrieved 2014-12-12. ^Daniel Guggenheim quoted in C.V. Glines, “The Guggenheims: Aviation Visionaries,” Aviation History 6(November 1996)(as cited in Tom D. Crouch, Wings: A History of Aviation from Kites to the Space Age, (New York, N.Y.: W. W. Norton & Company; Reprint edition (November 17, 2004)), p.238). ^Richard O. Hallion, Legacy of Flight: The Guggenheim Contribution to American Aviation, University of Washington Press. 1977. p. 88. ^The National Aviation Hall of Fame: Harry Guggenheim, Retrieved 2014-07-04. ^Delta Flight Museum: Western Historical Timeline, Retrieved 2014-07-04. ^“Western Airlines Marks Anniversary of S.L. Flight”, Salt Lake City Tribune, April 17, 1944, p.16. ^“S.L. 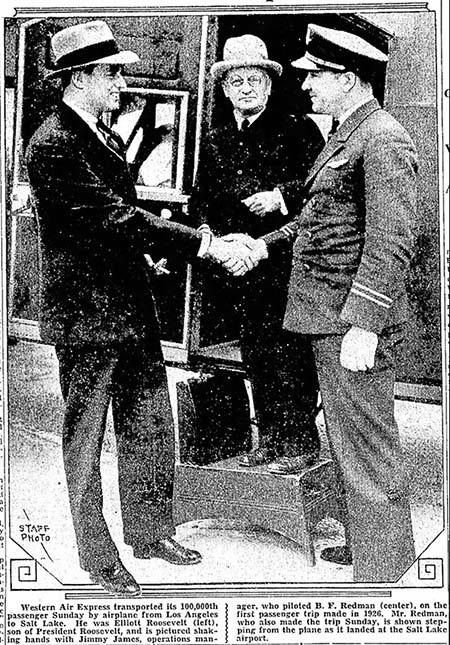 Will Commemorate First Commercial Flight”, Salt Lake City Tribune, December 12, 1934, p.36. ^Nevada Aerospace Hall of Fame: Harris M. Hanshue. Retrieved 2014-11-11. ^“Officials, Public Laud ‘Unique’ Air Terminal”, Salt Lake City Tribune, June 18, 1961, p.14. ^Robert J. Serling, The Only Way to Fly: The Story of Western Airlines America’s Senior Air Carrier, (Garden City, New York:Doubleday & Company, 1976), p.40. ^Claude Gray, “The Old West”, The Vintage Airplane, February 1976, p.12. ^Grant quote from Bowie, “Weather and The Airplane,” p.17 (as cited in Hallion, p. 97). ^James G. Woolley and Earl W. Hill, Airplane Transportation (Hollywood, Calif.:Hartwell, 1929), p.45. ^League of Nations, Inquiries into the Economic Administration and Legal Situation of International Aerial Navigation (geneva: League of nations, 1930), p.8; Ronald Miller and David Sawer, The Technical Development of Modern Aviation (London: Routledge and Kegan Paul, 1968) p.13 (as cited in Tom D. Crouch, Wings: A History of Aviation from Kites to the Space Age, (New York, N.Y.: W. W. Norton & Company; Reprint edition (November 17, 2004)), p.209). ^Carlos A. Schwantes, Going Places: Transportation Redefines the Twentieth-century West, (Indiana University Press, 2003), p. 8. ^Nick Komons, Bonfires to Beacons: Federal Civil Aviation Policy under the Air Commerce Act, 1826-1938 (Washington, D.C.: U.S. Department of Transportation, 1978), 66 (as cited in Crouch, p.239.). ^Andrew R. Thomas, Soft Landing: Airline Industry Strategy, Service, and Safety, Apress. 2011, p.22. ^Global Airline Industry Program: Airline Industry Overview, Retrieved 2014-07-04. ^Airlines For America. Retrieved 2014-07-04. ^Airline Handbook Chapter 1: Brief History of Aviation. Retrieved 2014-07-04. ^Century of Flight: Commercial Aviation 1920 to 1930. Retrieved 2014-07-04. ^Nick Komons, Bonfires to Beacons: Federal Civil Aviation Policy under the Air Commerce Act, 1826-1938 (Washington, D.C.: U.S. Department of Transportation, 1978), 67 (as cited in Crouch, p.249.). ^Telegram, Byrd to HFC, Sept. 27, 1929, DGF Papers, box 2 (as cited in Hallion, p. 124). ^Delta Flight Museum: Family Tree. Retrieved 2014-07-04. ^The Wright Story, Wright Brothers Aeroplane Co. retrieved 7-4-14. ^Beating the Odds: The First Sixty Years of Western Airlines, Western Airlines, 1985, p.5.